Today, a sudden curiosity struck me. How is global warming since the pre-industrial era? Before introducing my figures and tables, I want to mention the IPCC's projections. The IPCC AR5 forecasts four different outcomes for global warming. Relative to the reference period of 1850−1900, the global surface temperature had risen about 0.61 °C until 1986-2005 period. RCP2.6 is keeping the global warming below 2 °C by limiting the temperature rise at 1.61 °C. RCP8.5, the worst cast scenario, predicts the global warming could be 4.31 °C above the 1850-1900 average (Working Group I, 2013). Currently, our world is walking the path of RCP8.5 (Le Quéré et al., 2014). It means that no climate policy is working. To make things worse, technology does not help the climate mitigation, either. A recent study revealed that the globally-welcomed technological breakthrough known as hydraulic fracturing (i.e., fracking) of shale gas might lower natural gas price but will fail to reduce global greenhouse gas emissions (McJeon et al., 2014). If we continue what we are doing now, the 2 °C goal would be shelved forever before the middle of this century. Now, the following is my attempt to draw figures of long-term annual temperature changes. A recently launched global temperature database (Berkeley Earth, 2014) gave me a good time series data set for answering my question asked in the first sentence of this post. 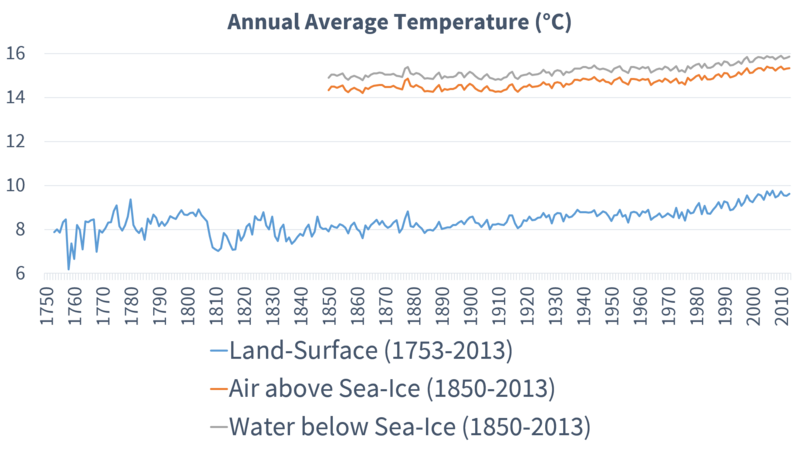 I tried to track down the trends of temperature in land-surface, air, and sea-water since before the Industrial Revolution. There is a caveat, though. As I have explained in a previous post, temperature change estimates for any periods older than 1850 (in this case, 1753-1850) entail a high degree of uncertainties (You will understand what I mean by "uncertainties" when you see a graph below that shows a wide range of land-surface temperature fluctuations during the first century since the industrialization.). In addition to the annual recorded (or estimated) temperature data, therefore, I will calculate the range of global warming compared to the average temperature of 1851-1880 period. After the graphs, I will copy the data table for anyone interested in specific numbers (Table 3). Land-surface temperature has shown the largest change among the three series. 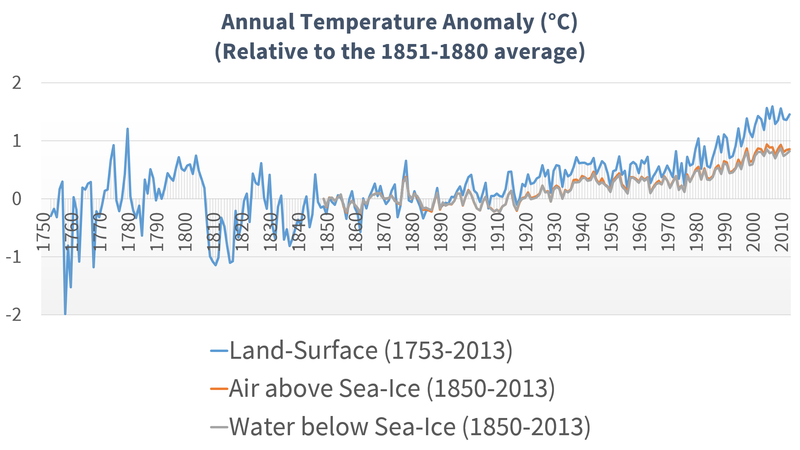 The global land-surface temperature rose from 7.874 °C in 1753 to 9.622 °C in 2013. It is a warming of 1.456 °C above the 1851-1880 average (8.166 °C). However, most of our discussion about climate change is about atmospheric temperature. The temperature of air above sea-ice has warmed from 14.330 °C in 1850 to 15.331 °C in 2013, which is 0.860 °C warmer than the 1851-1880 average (14.471 °C). If the world wants to keep the warming below 2 °C above the pre-industrial level, there is only a 1.140 °C margin remaining. In fact, the IPCC Working Group I's Fifth Assessment Report (AR5) stated that the globally averaged combined land and ocean surface temperature showed a warming of 0.85 °C over the period 1880 to 2012. In addition, there might be some people who wonder if this data set shows an evidence of the global warming hiatus since 1998. (Trenberth, 2015). I made a comparison table for them, below. It seems that there was no such "hiatus" since 1998, although the latest 6 years were slightly cooler than the latest 11 years. Recent studies (e.g., Miller et al., 2014) are listing several reasons for the discrepancies between climate model (CMIP5) forecasts and actual temperature changes. They are (1) less solar radiation than the models estimated, (2) more effects from aerosols than the model simulation results, (3) a bias in the observations due to less data from the arctic regions than other regions, and (4) effects from ENSO (El Niño Southern Oscillation). Wow, A lot of time and effort went into this. Very interesting visual. As I glance through the analysis, I don't see any real issues with your work. It does seem worrisome. I'm concerned that the "hiatus" that many people would like to believe and the abundant, low-price of oil will lull people into a false sense of security. I'll book mark them for future reference. In addition, my previous posts could be a little helpful to you, if you're interested.